Are you THAT person? The one who's standing in line at Best Buy in the freezing cold at 5:00 a.m. just so you can be the first to get your hands on the newest smartphone? We hear you; new technology is exciting and fun to interact with, however, there are some factors you should take into consideration before jumping on the early adoption bandwagon. How much would it cost your business to be offline for a few hours? Or a few days? IT is a core component to running and operating daily business functions, and most businesses cannot function when their IT infrastructure goes down. Investing wisely in your IT could help you save more in the long run. Many IT costs are significantly less than they were even a few years ago, such as bandwidth and storage. Internet circuits have also significantly reduced in cost. Many times, people stick with the same plan they had signed up for years ago and are now unknowingly overpaying. Cyber attacks can occur at any moment. Many businesses struggle to defend themselves against these attacks, leading to halted business production and an explosion of costs. Whether it’s a small mistake of one of your employees, dangerous viruses, or malicious network intrusion (i.e., hacking), the impact can be considerable. Many businesses have tried to solve their IT issues internally, causing major distractions and the potential of inadequately fixing the issues. As Microsoft ends support for Windows Server 2003 on July 14, there’s no better time to educate yourself on Microsoft Azure – especially if you are considering an infrastructure refresh in the near future and are thinking of moving to the cloud. Chances are you’ve heard of Azure – but what exactly is it and what are the benefits of using it? Simply put, Azure is a public cloud platform developed by Microsoft that offers a collection of services. There is a full cloud option, as well as a hybrid option, which uses both on-premise resources and the public cloud. Azure supports current Microsoft and Linux operating systems, languages, tools, and frameworks so you can build a scalable infrastructure to meets your needs. A global survey by Forrester indicates that 7 out of 10 workers still spend 4-5 days a week at an assigned desk, 88 percent of phone calls are still made from a desk, and more than half of work-related calls are actually made using a desk phone. Let’s face it – we often take our business on the road with us. Whether it’s a quick email while sipping a Mai Tai on the beach or building a presentation for a sales pitch in the heart of Paris, we can all use a few quick travel hacks. But there are risks involved. Here’s a list of things to consider when using your work technology on the road. Working on the road is the norm these days. According to the recent Global Business Travel Association report, U.S. businesspeople took over 452 million domestic and international trips for work in 2012. “We say business travel drives business growth,” said GBTA executive director and CEO Mike McCormick. Here’s a fun fact: Did you know that major distribution companies can achieve an 89 percent reduction in process time utilizing SharePoint process automation tools? According to Microsoft, 78 percent of Fortune 500 companies use SharePoint in some way. So, what is SharePoint? Simply put, organizations use SharePoint to create websites. But it’s so much more. A robust business collaboration and document management platform, it helps teams collaborate and manage their own websites and content. Small to medium-sized businesses can leverage SharePoint to collaborate with their teams and become more efficient, reducing valuable staff time and increasing your ROI. And the best part? SharePoint comes free with Office 365! So Your IT Pro Left: What’s Next? 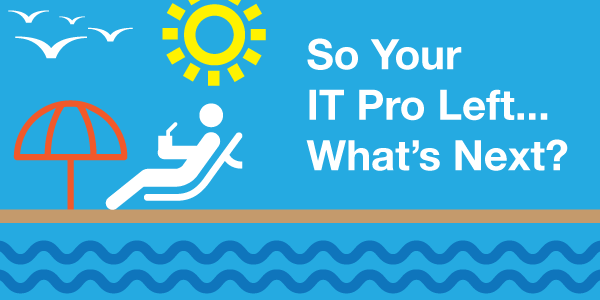 Picture this: Your long-standing IT pro decides it’s finally time to move on and live his dream life as a surfer somewhere off the grid. His dream has become your nightmare because he handled EVERYTHING. What do you do when you’re faced with this dilemma? Do you replace the person, find an IT management partner, or something in between? Keeping your technology up-to-date, maintaining your data regularly and securely while providing your tech team with professional development opportunities and benefits is expensive. Relying on a few people to manage your complex business technology is a potential disaster waiting to happen. 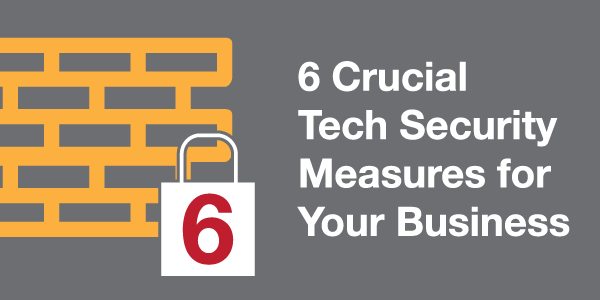 One data breach or server failure can significantly impact your business operation and cripple you for good. Do you realize that there’s greater value in hiring an outsourced IT department than hiring just one in-house IT staff? Outsourcing an IT department is a reliable, cost-effective way to provide 24/7/365 service to monitor and maintain your IT infrastructure morning, noon, and night with a skilled team of professionals that offer certifications and disciplines no small, internal group could offer. What do Target, Sony Pictures and eBay have in common? All have endured security breaches in the last 18 months that have affected their image, business operations and maybe even most importantly – their bottom line. The lifeblood of modern business is accessibility to data in real time. If you find yourself in the middle of a data breach, you can kiss at least one of the three goodbye; at least in the short term. And not all businesses get off that lucky. 60% of all small to medium sized businesses (SMB) fail to return to business after such an event, according to the article by Business News Daily. In 2014, three out of four respondents to a US State of Cybercrime Survey said that they had to deal with at least one IT security incident. Over a third of respondents said that the number of security incidents they dealt with increased from years prior. This underscores the importance of focusing on your security. To face these challenges, companies need to partner with knowledgeable IT service providers. After all, the safety of your company’s data depends on your Managed Service Provider’s expertise in this area.